In conjunction with the 2015 White House Science Fair on March 23, Discovery Communications and two of its subsidiaries, the Science Channel and Discovery Education, unveiled palns to launch a new initiative called "Support Our Science," that will provide one school each in Houston and Atlanta with materials for a comprehensive program in science, technology, engineering and math (STEM) education. The announcement of the Discovery Communications commitment was one of several made during the science fair that amounted to $240 million in private-sector donations to improve STEM education in American schools. 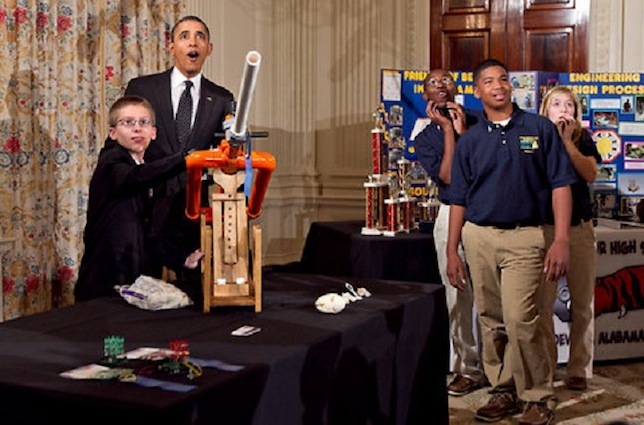 Also during the day, a number of young scientists presented their projects that won science competitions around the country for President Barack Obama to see and experience. An attitudinal study to measure the impact of the program. A third school will also be awarded the STEM program through a competition that will begin May 1 and that parents and teachers can submit entries for. "Thank you, Science Channel and Discovery Education, for developing this program for our educators and students," said Fulton County Schools Superintendent of Academics Scott Muri. The Science Channel is a television network with science programming that reaches 76 million households in the United States and Discovery Education provides standards-based digital content and professional development for K-12 teachers and students. Both are divisions of Discovery Communications. "Children possess a natural curiosity about the world around them, how things work and why things happen," said Science Channel General Manager Rita Mullin. "Science Channel is excited to help students ignite that natural curiosity into a passion."